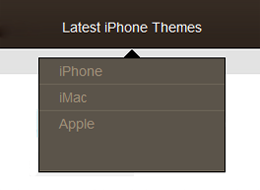 The following CSS code, will ensure that the dropdown looks and works properly. Also we will add a pointer arrow image and do some CSS tricks, so we can have the arrow centered at the top of the dropdown. It works well in all of the major browsers, including IE7+. In IE6 the drop-down does not show up but there are fixes for that and the dropdown will still show up centered, after we apply the fix. Let me know how it works for you or if you have any questions regarding the method. Hi Thank’s for this I’ve been looking for this solution for a long time, just one question, is it possible to animate the menu with a slidedown effect? Yes, it is possible to animate it with a slidedown effect, or any other jQuery animation, but this is outside of the scope of this tutorial. So what’s the IE6 fix? I was wondering if you could show it. Hi I’m having a little problem with this code and a mootools script called mediaboxadvanced. The problem is only in IE7 and above, if include the mootools script the submenu appears but not in it’s place, if i remove the mootools script then the menu work again, if i leave the mootools script and remove your code then the menu appears in the right place (not centered). I really don’t know how can i fix this, in all the other browsers your code and mootools work fine. Is there any other way to center the submenu but with a different code? I wasn’t using any right or left margins on my li’s only padding so I had to add a little more math to this line: var width = parseInt((child_width – the_width)/2); to add in the amount for the padding right and left that I was using. I’m trying to get the script to target the dropdown menus generated by jQuery Superfish in a WordPress site. It seems either I’m not targeting the right ul.class or ul#id – it’s disregarding the script somehow. I’ve added your script in the head of the site and it’s loading. Thank you for the script, by the way! Here is the code I used to center a dropdown navigation using jQuery. Please keep in mind that I haven’t tested it cross-browser yet, but I thought I’d share in case anyone wants to use it. I’m using padding instead of margin, too. Which additional lines did you add to your code that it works? Nice script! It doesn’t work properly when there’s padding / margin on the list item though. Easy solution: put padding or margin on the link.